Meet MPCX’s team of highly qualified and experienced professionals. 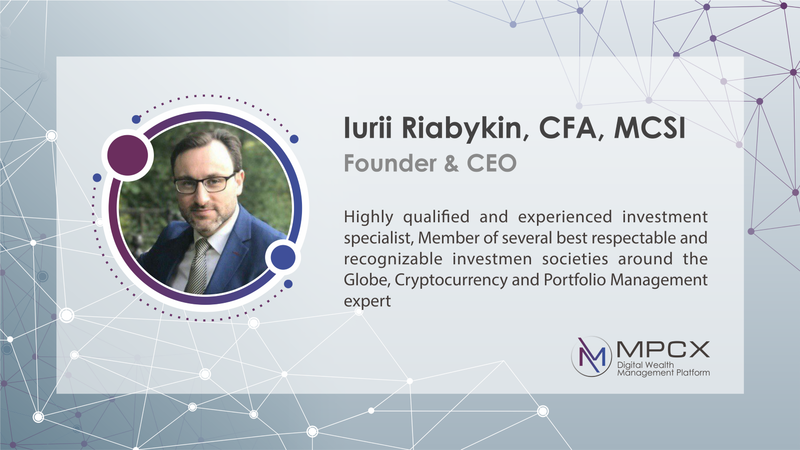 Iurii Riabykin, CFA, MCSI is a highly qualified and experienced investment specialist and the member of several best respectable and recognizable investment societies around the Globe. He has built an incredible career in financial markets as the Equity market professional and Wealth and Portfolio Manager. Iurii started his career as an Equity Sales, continued as a Fund Manager and eventually has become an innovative investor with strong belief and passion about the future of Crypto Assets and disruptive abilities of the technology behind. Iurii graduated from one of the most recognizable Russian financial universities where he has studied financial markets and financial engineering. During this time Iurii’s interest in complex financial products and disruptive technologies has been growing and eventually lead him to Crypto Assets. Since October 2016, Iurii is a regular member of CFA Institute and CFA Russia. In 2017 Iurii joined CFA UK Society and as well as became a member of Chartered Institute of Securities and Investments. Phil Millo is a highly experienced entrepreneur, financial professional, crypto structuring and portfolio construction expert, family office investor, blockchain and ICO advisor as well as public speaker with more than 25 years of successful experience. 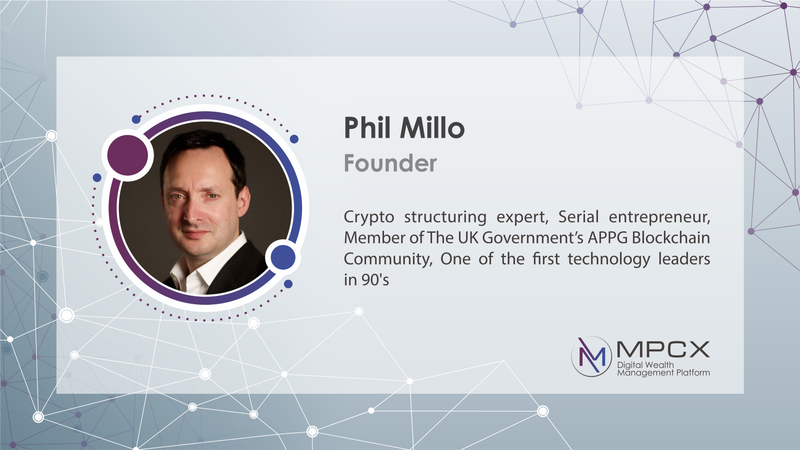 In addition to the active role in MPCX development, Phil is the CEO of MCX, a full service crypto-structuring firm based in London and Luxembourg. He is a recognized expert on the creation of crypto-based financial products, and is named on several patent applications relating to blockchain consensus algorithms. He is a member of the UK Government’s ‘APPG Blockchain’ community and is an advisor to a number of specialist ICOs. He has spent much of the last decade executing advanced fiat structures and advising ultra-large asset managers and sovereigns on alternative assets. In the 90s he was a technology leader and was voted one of the top 100 most important people to have driven the first decade of the commercial internet. 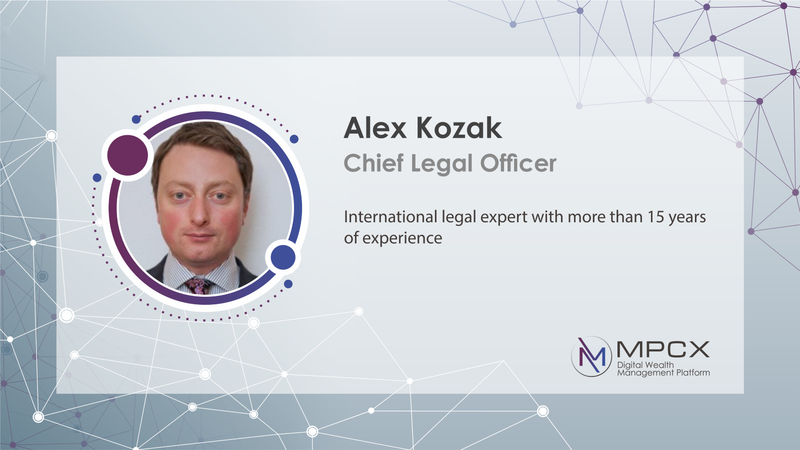 Alex is a senior legal advisor and co-founder of the project. Alex started his legal career as an intellectual property lawyer, which followed 10+ years’ exposure to international natural resources sector. Recently Alex has been advising several UK start-ups in different stages of development, mostly in financial sector. Recent boom in blockchain and cryptocurrencies shifted market interests from pure financial investments into disruptive technologies. Lack of blockchain regulation by government officials makes advising in this area more challenging, but at the same time it creates new opportunities of monitoring legal and regulatory developments at very early stages, literally as we speak. Alex believes that blockchain and cryptocurrencies are here to stay and crypto-finance is the new economic reality. Md. Sadek is an experienced Blockchain technical expert with more than 10 years of research and development practice. 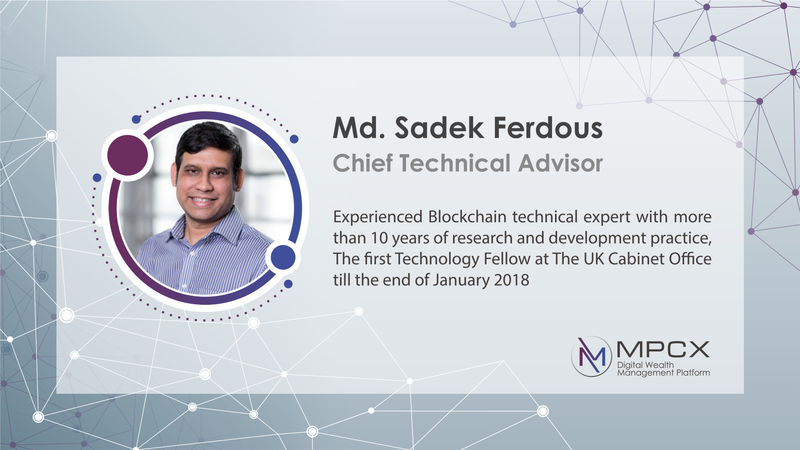 In addition to active advisory position at MPCX, Sadek is currently working in a project involving identity and blockchain technology at the Imperial College Business School. Sadek was the first Technology Fellow at The UK Cabinet Office till the end of January 2018. Before that Sadek worked in a Horizon 2020 project called SUNFISH (SECURE INFORMATION SHARING IN FEDERATED HETEROGENEOUS PRIVATE CLOUDS) at the University of Southampton, in which investigated how the blockchain technology like Ethereum could be utilised to deploy a secure monitoring infrastructure for cloud systems and worked as a Post-doctoral Research Assistant at the University of Glasgow. Sadek completed his PhD from the School of Computing Science of the University of Glasgow and where he defended graduation thesis related to “Usercontrolled Identity Management Systems using Mobile Devices” in which he investigated how mobile devices can be used for managing different online identities. Sadek is a very research oriented and love to face new challenges and develop novel mechanisms based on his research. His current research interests are Blockchain, Identity Management, Security Usability, Trust Management, Petname Systems, Trusted Computing and Privacy Enhancement Technologies. To learn more about MPCX and XDMC Token readers can visit our website http://mpcx.co, read the MPCX’sWhitepaper or simply join us on our social media channels: Facebook, Twitter,Medium, Instagram, YouTube, Telegram and LinkedIn.